According to Statistics Finland, the value of new orders in manufacturing was 34.7 per cent lower in May 2018 than twelve months earlier. The fall is largely explained by the exceptionally high value of new orders in the corresponding time period of the previous year, generated by a few large orders in the metal industry. 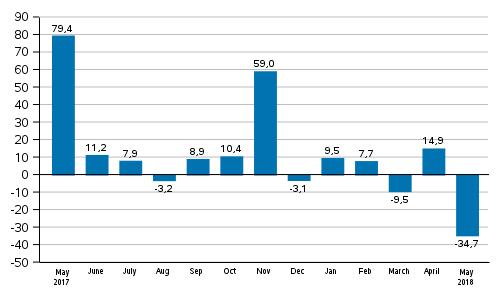 During January to May, orders went down by 6.3 per cent from the year before. Enterprises received more new orders than twelve months ago in May in the paper industry and the chemical industry. In the industry of the manufacture of paper and paper board products, orders grew by 4.4 per cent and in the chemical industry by 4.1 per cent year-on-year. In the metal industry, orders declined by 47.1 per cent from one year ago. The fall in orders in the metal industry is largely explained by the exceptionally high value of new orders in the corresponding time period of the previous year, generated by, for example, large new orders in the shipbuilding industry. ISSN=1798-6737. May 2018. Helsinki: Statistics Finland [referred: 22.4.2019].